In Russia's Last Gasp, Prit Buttar looks at one of the bloodiest campaigns launched in the history of warfare - the Brusilov Offensive, sometimes known as the June Advance. The assault was intended to ease the pressure on Russia's British and French allies by diverting German troops from the Western Front and knocking Austria-Hungary out of the war. Russia's dismal military performance in the preceding years was forgotten, as the Brusilov Offensive was quickly characterised by innovative tactics, including the use of shock troops, a strategy that German armies would later adapt to great effect. Drawing on first-hand accounts and detailed archival research, this is a dramatic retelling of the final years of the war on the Eastern Front, in which the Russian Army claimed military success but at a terrible cost. Prit Buttar studied medicine at Oxford and London before joining the British Army as a doctor. After leaving the army, he has worked as a GP, first near Bristol and now in Abingdon, Oxfordshire. He is extensively involved in medical politics, both at local and national level, and served on the GPs' Committee of the British Medical Association. He appears from time to time on local and national TV and radio, speaking on a variety of medical issues. He contributes regularly to the medical press. An established expert on the Eastern Front in 20th century military history, his previous books include the critically acclaimed Battleground Prussia: The Assault on Germany's Eastern Front 1944-45 (Osprey 2010) and Between Giants: The Battle for the Baltics in World War II (Osprey 2013). 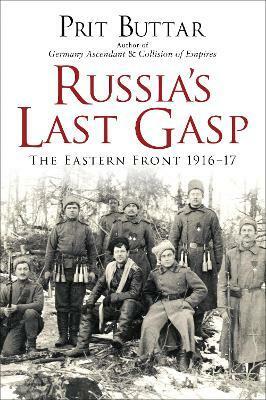 Russia's Last Gasp: The Eastern Front 1916-17 is the third book in a four-volume series, the definitive study of the First World War on the Eastern Front.